Be prepared to suddenly be everyone's favorite person. 1. A Breville panini press that'll create deliciously brown, crispy outsides and gooey, non-crushed insides for the ultimate sandwich every time. Or the ultimate wrap, quesadilla, croissandwich, or anything else that floats your boat. Get it from Amazon for $98.95. 2. An incredibly real-looking faux fur throw blanket to give any home a touch of interior-design-magazine-meets-Winterfell luxe. Promising review: (I know it's long, but it is GLOWING) "You know how sometimes when you order an item after you've wanted it for so long, and you've built it up in your mind so much that when it finally arrives you're a bit disappointed? Well, this isn't going to be one of those times. Even after reading multiple glowing reviews, I hesitated to order it. I didn't want to invest $155 in something I would be less than thrilled with so I debated, hedged, and chewed my nails for weeks before finally taking the leap. 3. A vault of fan-favorite Smashbox Always On liquid lipsticks for the person who could never (and I mean never, ever, ever) have enough shades of velvety matte gorgeousness. 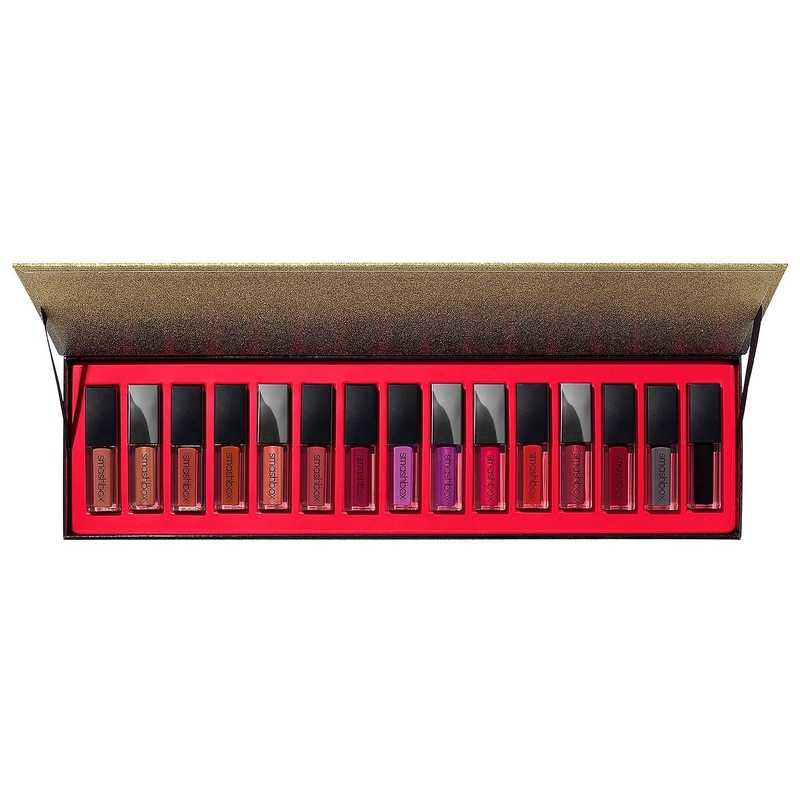 Get the set of 15 from Sephora for $136.50 (originally $195; valued at $261). 4. A mini (but bright and powerful) multimedia projector perfect for turning any room into a movie or gaming room. Just plug in a phone, gaming system, streaming stick, or laptop. Promising review: "Very happy with this projector. Even though the dimensions are listed, I was still a bit surprised a how small the unit actually is. Even with the projector 15 feet away from the screen it is quite bright, certainly bright enough for a movie outdoors, which is what we bought it for to begin with. I was also pleased to find out I can plug my Roku Streaming Stick+ directly into the HDMI and USB port which made for a very small footprint of stuff I need to bring outdoors to project a movie. All in all very happy with the performance and price of this unit." —Gary C.
5. And an Amazon Fire TV stick you can simply pop into your existing TV (or the projector above!) and stream all the shows, movies, and music you want. 6. Leather touchscreen gloves with ~patented~ technology, because it's 2018, and you don't need to have frozen fingers to text properly. Get them from J. Crew for $150. It's not just a model — you can open it up to see the interior, too! The 1,416-piece kit also features five mini figures: Supreme Leader Snoke, First Order Officer, First Order Stormtrooper Sergeant, First Order Stormtrooper and First Order Shuttle Pilot, BB-9E and buildable Medical Droid figures. Get it from Amazon for $159.95. 8. A 12-pound weighted blanket (it's called a calm-forter) that'll feel just like a soothing hug for an added dose of security. And unlike other weighted versions, this just looks like a regular fleece blanket a with a silky side and a nubby side for fully customizable relaxation. 9. A luxe velvet House robe you're sure to think was woven with magic — that's how soft these are. Gladrags Wizardwear wishes it could. Santa, if you're reading this, I'll take a Ravenclaw in a S/M. Get them from PB Teen for $149 each (available in all four Houses and two sizes: S/M and L/XL). 10. A school spirited crossbody to keep any college student's (or alum's) belongings safe while tailgating or cheering on their favorite team. Get this University of Wisconsin triple-zip crossbody from Dooney & Bourke for $89.60. Team prints are available in *tons* of bag styles and 32 different schools — check out their full collegiate selection to select your alma mater and bag style! 11. An Italian leather wireless charging accessories tray so you can keep your phone (while charging), glasses, rings, wallet, and keys handy. Aka you'll never forget anything again, and no dealing with those pesky fraying phone-charging cords. 12. A hilarious (and actually useful) post–zombie apocalypse survival guide, including over 80 recipes, food scavenging tips, and illustrated guides on living in the wilderness, whether the undead are after you (and your tasty brain) or not. Get it from Amazon for $16.13. 13. A vintagey 8-in-1 entertainment center that'll do it all: play records, stream music from your phone via Bluetooth, record from vinyl, CD, or cassette directly to USB, AND play CDs, cassettes, aaaaand AM/FM radio. Get it from Amazon for $131.99+ (available in five colors) or the white one from Urban Outfitters for $150. Promising review: "This record play has it all and works perfect. It was really easy to set up and the quality is amazing. Would absolutely recommend!" —Mila A. 14. A new (thinner! waterproof!) version of the Kindle Paperwhite with a glare-free screen so you feel like you're reading an *actual* book — without having to have to schlep around a heavy 1,000-page volume (looking at you, A Song of Ice and Fire). Personal note: I love the last edition of the Kindle Paperwhite so much. It's SO LIGHT that I keep it in my bag at all times — you never know when you're gonna have a spare 15 minutes for a chapter or two. 15. And a bath caddy so you can soak up some great lit while soaking in the tub — this one has room for a beverage, snack, candle, and of course your new waterproof Kindle Paperwhite. The expandable arms fit most tubs and have rubber on the bottom to keep it from slipping, plus the book holder is protected by a waterproof cloth to keep any errant splashes away. AND the bamboo is coated in a water-resistant lacquer to keep any mold and mildew at bay. 16. A holiday gift box from ButcherBox sure to delight any carnivore with a selection of feast-worthy steaks, poultry, sausages, bacon, and more. Choose from a selection of four boxes, tailored to your recipient's tastes. Get it from Butcherbox for $135+. 17. Truly luxurious cashmere socks for putting the best foot forward all winter. Get them from Free People for $60 (available in three colors). 18. A gift card to Winc, a wine subscription that'll deliver your favorite grape product right to your door — an ~expertly curated~ selection of everything from sparkling wines to pinot noir... from all across the world. Get a gift card in the amount of your choosing at Winc (if you get it before 11/25, you get 20% back!). When choosing your amount, note that subscriptions start at $13/month. 19. An HP portable photo printer that'll print photos on-the-go for trendy photo-within-a-photo Instagrams or at home for easy wall décor. Get it from Amazon for $99.95 (available in five colors). 20. A gift card to Trunk Club's subscription service for anyone who is tired of lit'rally everything in their closet. Here's how it works: You give 'em a gift card. Your loved one signs up and gets a selection of handpicked clothing, chosen for *them* by a stylist — straight to their door. They pay a $25 styling fee (which is credited towards anything they choose to keep), and items typically fall in the $100-$300 range. You can choose either men's or women's styles! 21. A vintage-style blueprint poster personalized for your pet. Because your pupper is an icon and they deserve the very best. Just hit the personalize button, select the dog's breed and gender, enter their name, and it's good to go! Get it from Uncommon Goods for $185. 22. Impossibly delicate solid gold bands studded with five diamonds for the perfect subtle sparkle. Get it from Ant Eva Crafts on Etsy for $139.50 (originally $155; available in yellow, white, and rose gold and rings sizes 3.5–11). 23. A 10-in-1 *ultimate* Instant Pot so you can slow-cook, pressure-cook, make rice and yogurt, and so, so, so much more — you can even sous vide in it! It has 16 smart programs, custom settings, and cook time indicators for your easiest and best Instant Pot experience ever. AND you can sync it with Alexa to guide your cooking! Get the six-quart size from Amazon for $93.92 (also available in three- and eight-quart sizes). 24. 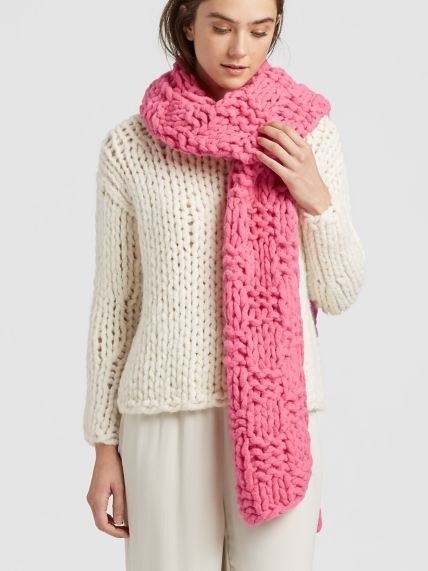 An enormous alpaca scarf that'll be the closest thing to wearing an actual blanket outdoors. Get it from Eileen Fisher for $198 (available in three colors). 25. A board of wizard's chess for spontaneous (and ruthless) games. 26. The Furbo, a treat-dispensing camera so any doggo-lover can watch their furry friend, talk to 'em, and (of course) dole out snacks while they're away. Get it from Furbo for $169. Learn more about it in This Awesome Treat-Dispensing Dog Camera Will Truly Upgrade Your Life. 27. A fun duvet set that'll take any kid's dreams to the next level — you can get it in a dinosaur print, ballerina print, mermaid print, astronaut print, and more. Get it from Amazon for $129 (available in sizes twin and full/queen and five patterns). 28. A reversible, smartphone-charging tote for the busiest bee you know who always carries *everything* around with them. Get it from Uncommon Goods for $119.95. 29. A holly jolly printed Opposuit that'll guarantee a win when it comes to who's best dressed at the holiday party. Check out of fun suits (in both men's and women's styles) on Amazon or Opposuits. (Another personal note: I bought this two years ago for our company holiday party and wore the blazer — it looks awesome IRL). 30. A 100% Mongolian cashmere sweater with detailing at the neckline to make it look like a vintage-y sweatshirt for a dose of cozy, casual cool. Get it from Everlane for $100 (available in sizes XXS–XL and seven colors). 31. Bose wireless headphones so you can work out, get a snack, or ignore your text messages while listening to your favorite playlist without being ~tied down~. Get them from Amazon for $173. 32. A countertop Aerogarden for growing all the herbs you want (no backyard required). And thanks to the LED grow lights, plus a watering-reminding system, no green thumb required either. The grow lights are energy efficient (aka they turn on and off automatically), and it tells you when to water (and feed with the included Miracle Grow plant food!) the baby greens, so these herbs'll basically grow themselves. The system comes with seed pods to grow Genovese basil, curly parsley, dill, mint, thyme, and Thai basil. Y U M! Get it from BuzzFeed's Goodful line, exclusively at Macy's for $129.99 (originally $189.99; available in three colors). 33. 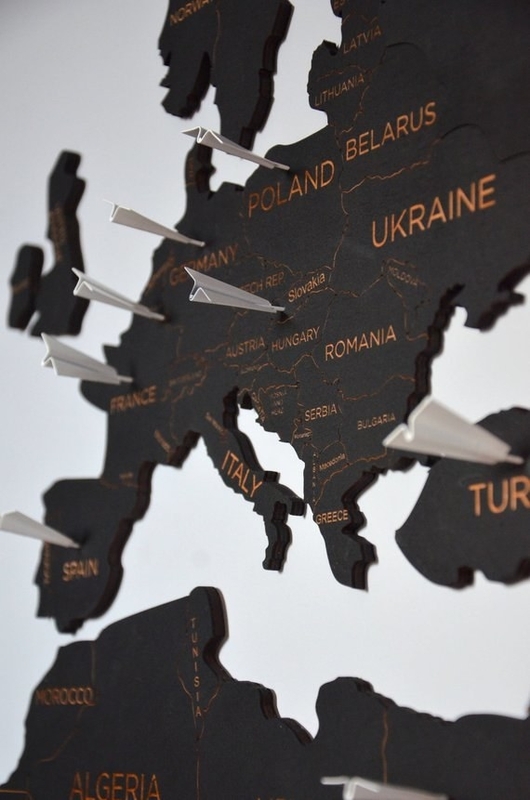 A birchwood map of the world with metal paper airplane pins so you can mark where you've been and where you want to go! 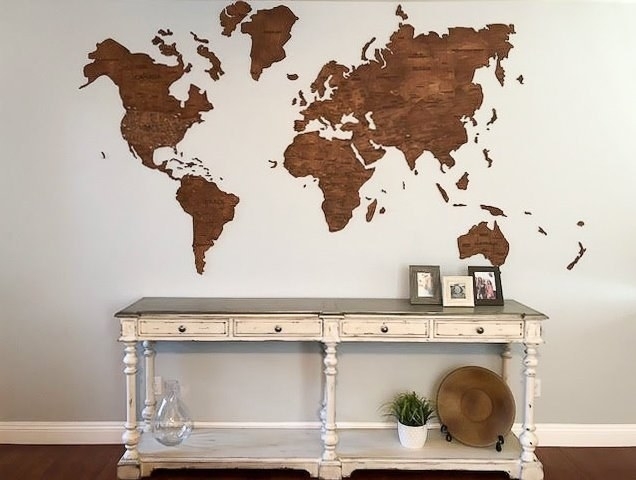 Get it from Enjoy the Wood on Etsy for $143.10+ (for the standard-size map plus 30 airplane pins; available in eight colors, or you can customize your own). 34. A ~timeless~ watch in a classic style that'll be cherished and worn for years to come. This gorge number is made with stainless steel and Japanese quartz, and it has luminous hands, so the watch it can be read at night, too. Get it from Nixon for $175+ (available in 24 styles). 35. A levitating moon lamp to add a touch of truly out-of-this-world magic to your home. It has a wireless charging base and is made by 3D printer for a perfectly seamless look. Get it from Apollo Box for $127.50 (originally $159). 36. 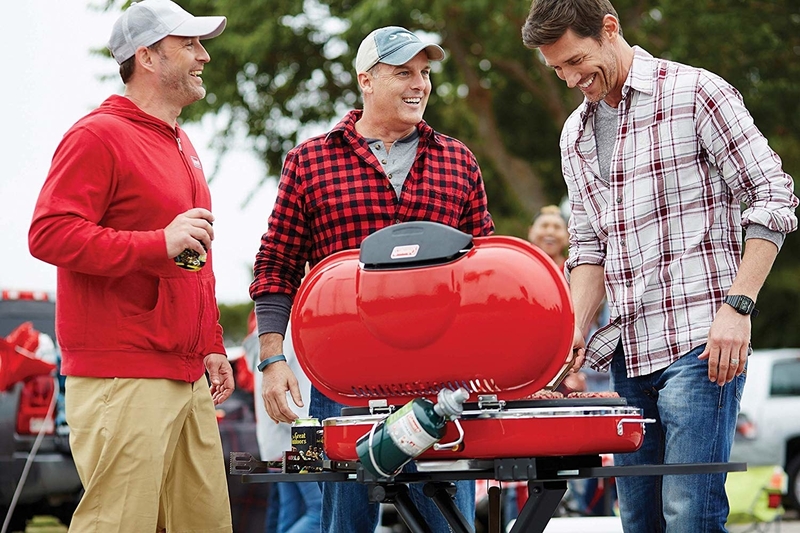 A portable propane grill (with over 3,000 five-star reviews!) for the person who never fails to invite you to their awesome tailgates. It folds to a compact size with a handle and wheels for easy pulling and sets up easily in just seconds. The cast-iron and porcelain-coated surfaces are super easy to clean, plus there's a removable grease tray. 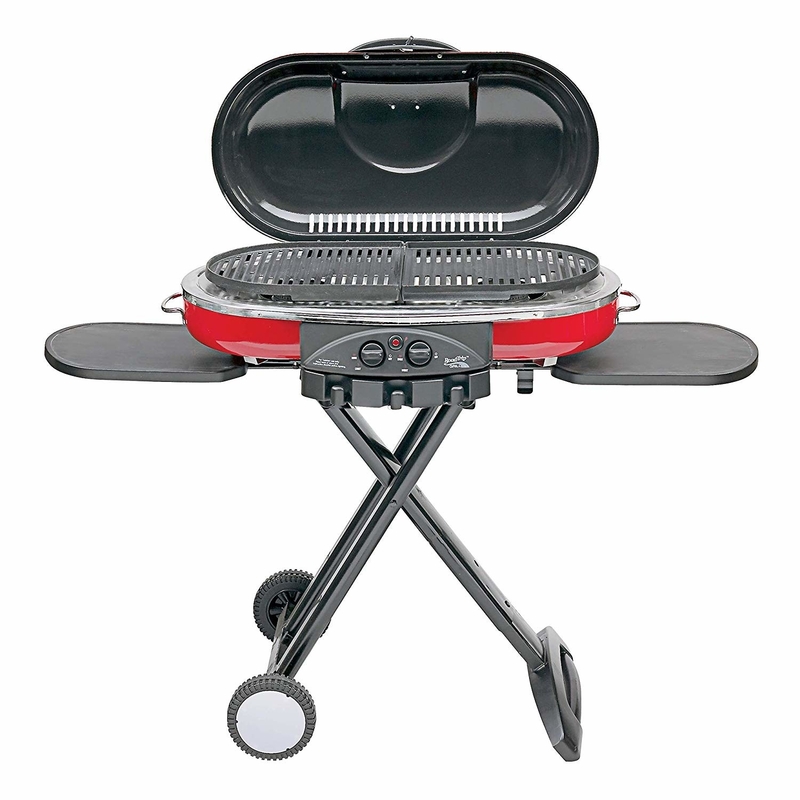 You can switch grill grates out for griddle and stove grates (which are sold separately). Aaaaaaaand it has two trays on either side perfect for resting your cooking utensils and condiments. Get it from Amazon for $123.64+ (available in eight colors). 37. A silicone face-cleaning brush that'll be like treating to a whole year's worth of facials. It vibrates to remove makeup, dirt, and excess oil, timing the process so you can get the whole job done in 60 seconds. Get it from Amazon for $118.15 (available in five colors). Check out a BuzzFeeder's review (spoiler alert: It's my review) of the Luna Mini 2 here (it's #7!). 38. BuzzFeed's Tasty One Top, an all-in-one cooktop that'll pair with your phone (and the Tasty app) so you can take each recipe step by step — it even adjusts the temperature and power settings to match each part of the recipe perfectly. Get it from Tasty One Top for $149 (currently on sale from $175; available in blue and black). 39. A Philips Sonicare Diamondclean toothbrush with four modes, three intensities, and three different brush heads so you can customize your cleaning to your dental needs. And it has sensors to show you on your smartphone where you missed so you can improve your brushing habits. (It's one of Oprah's Favorite Things 2017!). Get it from Amazon for $170 (available in six colors). 40. A truly giant dollhouse mansion complete with eight rooms, 34 pieces of furniture, an elevator, and large windows so you can look at it from all angles. It has over 1,600 reviews on Amazon! Get it from Amazon for $183.99. Promising review: "This was a Christmas gift for our granddaughter (now age two) and I am very happy to report that she loves it! It seems quite sturdy and it's sufficiently complex that it keeps her entertained longer than any of her other toys. Speaking as someone of a certain age, most kids today seem to have a whole lot to choose from in the way of toys, and that one of them is not only the favorite but gets lots of sustained use says something to me. Worth the price, from grandpa's point of view!" —Geoffrey B. 41. A gorgeous clear acrylic bar cart, because you should really share the gift of good taste. And because if you give them a bar cart, they'll serve you booze when you visit. Get it from World Market for $199.99. 42. A subscription to Rosetta Stone so you can prepare for your upcoming trip together. Get a 3-, 6-, 12-, or 24-month subscription for as low as $5.99+ (price per month decreases with longer subscriptions). 43. An extra-thorough DNA-testing kit that'll not only tell you about your ancestry and family history, but also about your genes and what they could say about your health and traits. Get it from 23andMe for $139. 44. An aromatherapy pendant necklace so you can take your favorite essential oils and scents on the go. Just add or remove the oil-filled wicks of your choosing depending on your mood. It comes with three wicks already included: calm, focus, and energy blends. 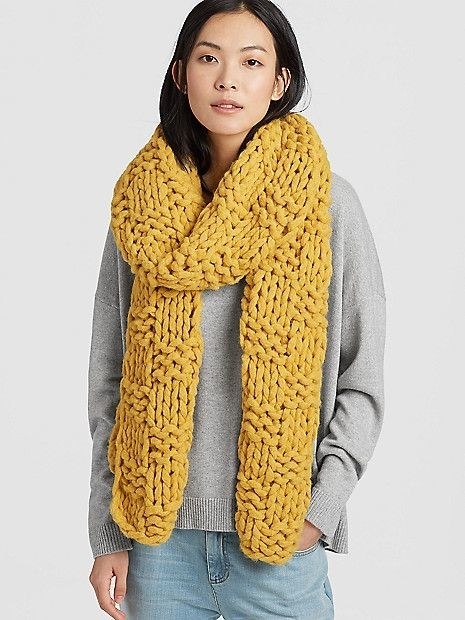 Get it from Anthropologie for $125 (available in yellow, white, and rose gold). 45. An LED light-up makeup mirror with bright and dimmed modes *plus* a USB charging port, built-in speaker, and voice assistant controls so you can apply flawless foundation, jam out to their fave tunes, leave with a fully-charged phone, *and* call a cab — all with just this mirror. Get the white from Urban Outfitters for $80 (originally $100). 46. A Nespresso Vertuo coffee and espresso maker that'll make your morning routine so much less stressful. Just pop in a pod (both espresso shots and full-size coffees available) and press a button. Caffeine is ready!! Get it from Amazon for $183.72 (available in five colors). 47. A pair of classic-for-a-reason shearling Ugg slippers with hard soles because you will NOT want to take them off when you have to go outsie to take out the trash. They have almost 2,000 reviews on Nordstrom alone! Get them from Nordstrom for $119.95 or Amazon for $119+ (available in sizes 5–12 and three colors). 48. A Nintendo 2DS XL for a lightweight and portable gaming system you can take wherever you go. You know you miss having your Gameboy with you. You can play all Nintendo 3DS, New Nintendo 3DS and most Nintendo DS games in 2D on it! Get it from Amazon for $134.59 (also available in white and orange). 49. A Drybar gift set complete with all the things needed for a "did you just get your hair done" look — right in the comfort of your own home. * On the Rocks Lightweight Replenishing Conditioner (to replenish moisture to dry, damaged hair without adding volume-crushing weight). Get it from Nordstrom for $199 (valued at $288. 50. A stylish acrylic Squatty Potty to make pooping easier so constipation is no longer a #1 (or should we say #2) consternation. Get it from Amazon for $88.20. 51. A sweet, salty, savory, and all-in-all scrumptious gift box of 15 different and delicious snacks for anyone whose favorite meal is snacktime. Wanna hear about what comes inside? (Deep breath): dark chocolate toffee pistachios, triple ginger cookies, chocolate-covered animal crackers, bourbon vanilla goat milk caramels, citrus hard candies, a peach ginger energy bar, teriyaki beef jerky, potato chips, sea salt and pepper pistachios, beer and caramel pretzel nuggets, sweet corn tortilla chips, rosemary and olive oil popcorn, pineapple mojito dried fruit, pimiento cheese kettle chips, and a blueberry toaster tart. Get it from Mouth for $116.50. 52. A compact Ninja Blender so you can basically give the gift of never-ending margaritas. And smoothies. And dips. And sauces. It comes with two see-through to-go cups, a double-walled stainless steel to-go cup, and a classic compact blending cup. 53. A giant Snorlax bean bag for one purpose and one purpose only: the best naps of all time. Get it from Think Geek for $149.99. It'll infuse whiskey with extra flavor thanks to the oak wood, which adds vanilla and marzipan-esque notes, coconut flavors, and tannins. Get it from Uncommon Goods: a two-liter barrel for $85 or a five-liter barrel for $110. For a little extra, you can also include a rum and whiskey making kit! Promising review: "Hubby has our basement set up as the ultimate man cave with a sports bar theme and small brewery. He pretty much has it all...so he thought!! This whiskey barrel was the perfect gift and is one of the highlights to his ultimate man cave. I did order the five liter with the rum and whiskey kit and am so glad I did. It was the perfect size for the bar counter. The personalization was also gorgeous...thank you for creating such an amazing product!!" —Best gift giving wife ever!! 55. A gorgeous Penguin hardcover boxed set of six Charles Dickens novels; they're a fancy addition to any small or large library. Get the set of six from Amazon for $102.38. Equally gorgeous boxed sets are also available for Jane Austen and the Brontë sisters. 56. Or a Hogwarts trunk full of all seven Harry Potter books, because if you're not passing on your love for HP, what are you even doing? Get it from Amazon for $123.56. Promising review: "This is a superb quality set of books. It comes very well packaged and ours arrived pristine, despite it weighing about 20lbs. 57. A dainty yet stunning stacking ring crafted from 18K gold. Every ring comes with one diamond plus the recipient's birthstone — pearl for June, sapphire for September, etc. Santa baby, please give me all of these? Want more? We also have gift guides filled with amazing gifts under $10, under $20, under $50, and under $100. Need more inspiration for your holiday shopping? Look no further! BuzzFeed has teamed up with Microsoft and their social AI Zo to help you shop for all those hard-to-shop-for people on your list. Send Zo a message on Facebook here that says #hacktheholidays to get started!